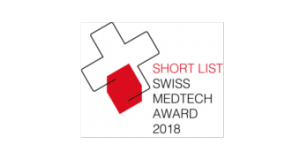 We are pleased to announce that SamanTree Medical has been part of the 7 Swiss Medtech companies shortlisted for the Swiss Medtech Award and interviewed by the jury. The award recognizes outstanding achievements in the Swiss medical technology industry. The Swiss Medtech Award will be presented as part of the Swiss Medtech Day for the first time on 12 June 2018.
ground breaking innovation with a considerable potential for large patient benefit and cost savings for the health care system. Among the 25 applications from companies of various maturity levels, we ranked 4th overall, which speaks highly for SamanTree Medical while looking at the top 3 finalists nominated: AWA, Bühlmann Laboratories and Xeltis. Congratulations to them! Click here to discover more about the Swiss Medtech Award.